"More people are choosing to shop at Tesco and our brand is stronger, as customers recognise improvements in both quality and value.He said the company was "firmly on track to deliver" its medium-term ambitions. Tesco's performance has gradually improved since 2014, when it reported the worst results in its history with a record statutory pre-tax loss of ?6.4bn.It has faced an intensely competitive retail environment in which German discounters Aldi and Lidl have stolen market share from the bigger supermarkets. 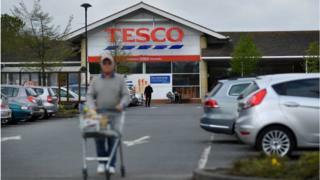 It was also hit with a ?250m penalty last year for overstating its profits in 2014.Tesco said that it added 260,000 more shoppers in 2017 and that sales of fresh food, its own-brand products and clothing had performed well.Mr Lewis also said the group was on track to deliver at least ?200m of annual cost savings after sealing its takeover of wholesaler Booker last month.